Yesterday was a bad day for thousants of unwanted animals that lost their lives because nobody gave them a second chance but for Boris, for Boris it was the best day ever. Thank you all for following his adventure. still in training, Boris is doing great. He even got himself a girlfriend! 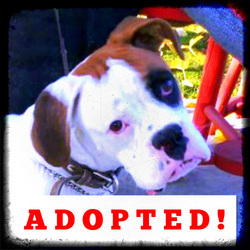 (by Celeste): 12/30/11 BORIS IS OUT AND SAFE!!! HE IS A GOOD BOY, JUST SCARED.. HIM.. THEY REALLY THOUGHT HE WAS NOT GOING TO MAKE IT OUT.. I HAVE VIDEO OF TIM GETTING HIM OUT ALMOST 9 MINUTES, AND TONS OF WONDERFUL PICTURES WILL UPLOAD TO THIS ALBUM.. AGAIN THANK YOU ALL SO MUCH.. AND SACHI IS AWESOME.. THEY TRULY ARE.. GOD BLESS ALL OF YOU AND HAPPY NEW YEAR.. 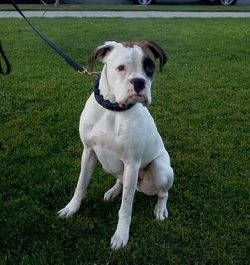 I KNOW IT IS A HAPPY NEW YEAR FOR BORIS ♥ ♥ 2 yr MALE NEUTERED BOXER, FOUND AS A STRAY, SCARED BUT OTHERWISE SEEMS OK PER NOTES FROM THE SHELTER.